Leading Manufacturer of hydraulic goods lift from Ahmedabad. 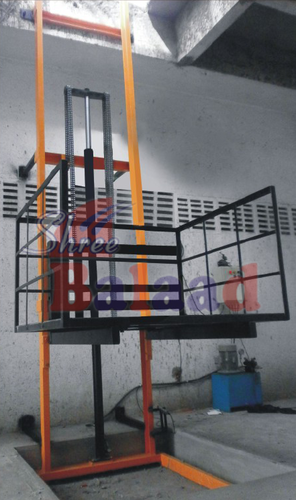 We are engaged in offering quality range of Hydraulic Goods Lift. • Used for material shifting from Ground floor to first & second floor. • These are self-standing lifts & no civil work like duct is needed. • Up & down movement with fully automatic Electro-Hydraulic Power Pack. • Adjustable overload protection valve gives safety against overloading. • Power drive unit is on ground for easy maintenance work. • Up & down movement are controlled by limit switches in addition to mechanical stoppers. • Occupies small space on shop floor. • Two lifting chains & 2 stand by ropes are provided as standard features. Looking for “Hydraulic Goods Lift”?